This story originally appeared in the December 11, 2012 edition of the Charleston Daily Mail. 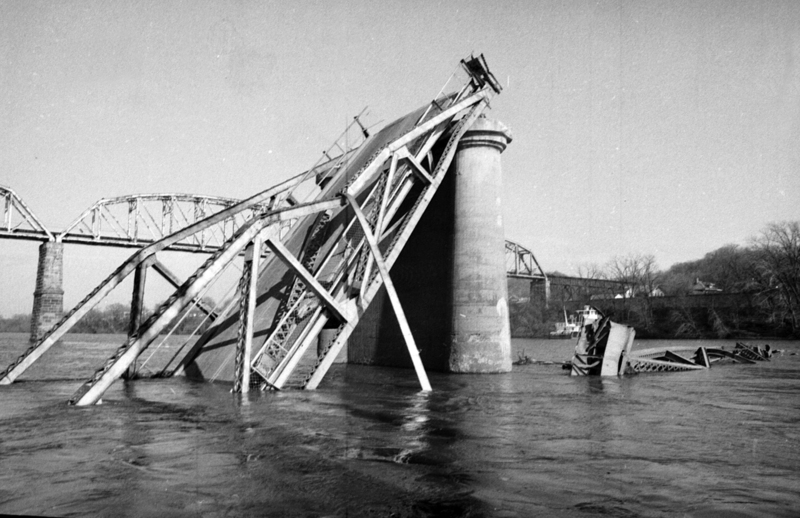 Ben Cedar crossed the Silver Bridge three times on the day it fell. He was working as a Kirby sweeper salesman back then, and crossing the bridge was the fastest way to get across the Ohio River from his home base in Ravenswood. He crossed the Silver Bridge for the final time just before 5 p.m. on Dec. 15, 1967, headed for Gallipolis, Ohio. Once there he stopped at a Kroger store and used a payphone to call his office, just to check in. Cedar headed back toward the span. He remembers seeing a large truck stuck on the Ohio side of the bridge, its trailer hanging down into the water. One of his co-workers was supposed to meet him in Gallipolis but had not yet arrived. For all Cedar knew, the man was on the bridge when it fell. About the same time, 31-year-old State Trooper Rudy Odell was standing on the West Virginia side of the river. He also was surveying the damage. Odell, now 76, might have been the first law enforcement officer to respond to the disaster. He was in downtown Point Pleasant when the bridge collapsed. Earlier that day, a man from Hutchinson Insurance called the local State Police detachment office wanting to talk with Odell, but he wasn’t at his desk. The secretary radioed Odell and asked him to stop by the man’s office. He parked his car on Main Street, just two blocks from the bridge’s on-ramp. He got out of the cruiser and had started to walk inside the insurance agency when he heard a low rumble. “It sounded like someone upstairs moving furniture,” he said. He left Clark and continued toward the collapse. It was a dreary, murky day, so Odell couldn’t see much of the wreckage. Some trailers had broken loose from their trucks and were floating downstream. Odell headed back to his car and radioed the State Police headquarters in South Charleston. He doesn’t remember what he did for the rest of his shift, but for the next few weeks he was stationed on a river barge helping recover vehicles and bodies from the river. Forty-six people died in the disaster, but Cedar’s coworker was not one of them. He was one car back when the bridge collapsed, right behind Charlene Clark. These eyebars were about 12 inches wide and 2 inches thick, resembling giant-sized automotive wrenches. A crack in eyebar number 330, on the Ohio side of the bridge, brought the entire structure down. Odell said as the bridge collapsed, the deck turned upside down, dumping cars and trucks into the water. The bridge fell moments later, crushing many of those vehicles. Workers had to remove pieces of the bridge from atop the cars before they could bring the vehicles out of the water. The U.S. Army Corps of Engineers leased 50-ton cranes to make the work easier, but the process was painfully slow. Odell’s primary job was to tag victims found inside the cars with the location and approximate time of their deaths before sending them to the morgue. He said police weren’t attempting to identify the bodies at that point, but often could. The State Police had received calls from people all over the United States concerned their relatives might have been on the bridge when it collapsed. When one of those loved ones arrived home safely, Odell said the families often called back so police could remove their names from the list of the missing. “We never brought up a vehicle or a person that we didn’t know was there before they came up,” he said. Three of Fout’s neighbors died in the collapse. She was working as a clerk at Mason County Insurance at the time, just a few blocks from the bridge. “We were getting our coats ready to go home, and we heard a large noise. I can’t exactly explain how it was; I can just remember it sounded like a swoosh. Then the lights went off in the office. We didn’t know what had happened,” she said. Fout was parked near the base of the bridge, but a floodwall blocked her view of the river. She could have walked another block to look in the water but did not want to. She got in her car and went home. When she returned to Point Pleasant for a hair appointment the next day, Fout said the town was very quiet yet busy with activity as recovery efforts began. She continued to avoid looking at the river. “I never went back there during the time of the recovery,” she said. Fout no longer averts her eyes. Beginning last year, she and her sister Ruth helped Hartford College professor Stephan Bullard and student Bridget Gromek write a new book, The Silver Bridge Disaster of 1967. And even a half-century later, parts of the story are left to be told. About three years ago, Bill Needham, a former truck driver from North Carolina, came into the river museum and told Fout he was on the bridge when it collapsed. Needham said his rig quickly sank to the bottom of the Ohio River. He held his breath until he was able to roll down a window and swim out. Fout said Needham told her the water was pitch-black when he finally escaped his truck but as he got closer to the surface, “he could feel the water getting lighter.” He grabbed onto some floating debris, and after 15 minutes in the water was pulled onto a rescue boat. Needham’s driving partner, Robert Towe, did not make it out of the truck. Towe, of Cana, Va., was a husband and father of three small children. He had just built a new home and purchased a farm. It was to be his last day as a long-haul trucker.